As the ability to travel and move around has gotten easier and easier, our desire to want to take home with us has kept pace. This is especially true for what we wear, and not only clothes, but jewelry. Jewelrytravel cases, as you would expect, come in many shapes and size, from simple stand-alone pouches, to jewelry specific compartments in existing luggage, to cases specifically designed to carry fine jewelry. 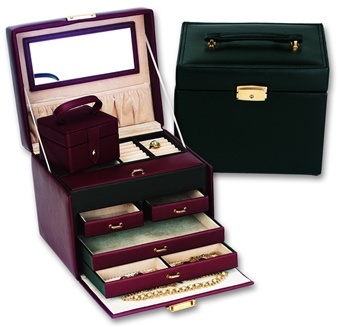 These cases are normally constructed in durable plastics covered by leather. This type of travel case construction is more durable than wood as well as lighter. 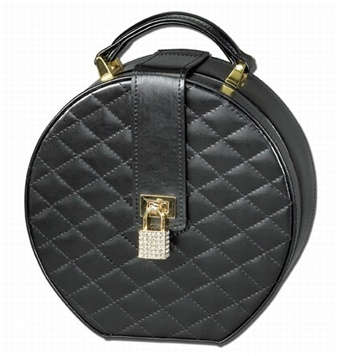 Designs vary from rounded handbag style jewelry travel cases to rectangular shapes, which are the most common. All will have sturdy handles, either of brass or leather covered plastic, and a locking mechanism will be standard. Larger travel cases will measure 13 inches by 9 inches by 7 inches, and rounded cases will be approximately 8 inches in diameter by almost 4 inches deep. The travel jewelry cases will have drawers, ring carriers, a mirror, and will be padded to ensure that the jewelry will not move around when the travel case is jostled. Examples of two popular leather clad jewelry travel cases are shown below and can be found, along with many other styles and colors at www.chasingtreasure.comhttps://www.chasingtreasure.com/.